Today, Turkey is facing three major problems and though it employs diplomatic skills to cater for the redressal of those problems, it has not been able to overcome the obstacles. The three issues the former Ottoman Empire is facing are: one, its EU membership efforts against which many European countries raise opposition, making Istanbul’s entry into the European parliament as a legitimate European state difficult, though the present Brexit move gives hopes for its speedy entry; two, the Kurdish problem, fueled by outside sources which has given a constant headache for the ruling AKP and its leader Erdogan; and three, its effort to lead Islamic world that are spoiled by war in Syria. Turkey’s chances of becoming a veto power depend on the successful handling by the government of these issues. Turkey is doing a faster burn on the Kurds. Having waged a fierce war against Kurdish separatists in southern Turkey, the Turkish government has taken military action against the Kurds of Iraq and Syria to prevent Kurdish forces from connecting two enclaves — one in Iraq and one in Syria — that could form the geographic beginning of an independent Kurdistan. Although Turkey has successfully resolved to sort out its issues with Russia and Israel so that it could put at rest the challenges from both these powerfully dictatorial states controlling the wars in Mideast by coordinating their destabilizing operations along with USA. When it found its assertive diplomacy is not yielding the desired fruits, Turkey has revised its strategy and renewed its ties with both Russia and Israel. A NATO member Turkey and an anti-NATO Russia do not have close ties and in fact ideally they cannot cooperate in international politics, either. In fact, Turkey joined the NATO very early when it felt the Soviet threat and the NATO used Istanbul in order to assert its ‘traditional” control over Islamic world, including Arab world and Iran. USA and UK and other big powers skillfully divided Turkey, Saudi Arabia, Iran and Egypt to deny them a place on the important UNSC veto system and made them fight for just non-veto position on the UNSC for usual two years by rotation. In fact, these top Islamic nations bitterly opposed each other on the UNSC with veto, unlike Russia which fought for China, its communist ally then, on the veto regime. . In the first four months of the year, Turkey’s exports to Russia dropped to $484.6 million, a 61.5 percent decrease compared to the same period of 2015. The head of the Agriculturalists Association of Turkey (TZOB) earlier noted that his sector’s losses had reached $290 million over the year due to the political problems with Russia. “Russia’s share in our fresh fruit and vegetable exports was 39 percent on an amount basis and 42 percent on a value basis. The sector’s exports have been negatively affected since sanctions were imposed by Russia on Jan. 1. While Turkey made around $368.2 million in revenue in exchange for around 530,000 tons of fresh fruit and vegetable exports to Russia in the first five months of 2015, this figure plunged to around $78.2 million of revenue for some 113,000 tons of exports”. A downturn in relations occasioned by Turkey’s downing of a Russian jet last November especially impacted economic and trade ties. When Turkey developed tension with Russia over the latter’s violation of Turkey’s air space, Israel moved swiftly to win over Russia and Netanyahu became a regular visit to President Putin’s office in Moscow as part of their joint strategy in Syria and West Asia in general. Turkey felt the pinch which was unbearable. Hence Turkey decided to move cautiously and make over with both Russia and Israel, maybe on US advice. Thus Istanbul’s effort to neutralize the badly tensed situation harming its interests has made it a favourite of both countries. Relations between Russia and Turkey have taken a nosedive over the Syrian civil war, particularly after Turkey shot down a Russian plane. But even before that, Turkey’s support of Sunni jihadist organizations was a thorn in the side of Russia, which still fears Sunni jihad inside southern Russia. Russia has goals in Syria and Israel also has requirements. After roughly nine months of disagreement, Turkish President Recep Tayyip Erdoğan and Russian President Vladimir Putin agreed to revive their stalled bilateral relationship in their first direct contact on June 29, fueling hopes about restoring economic and trade ties. According to experts, recent moves to normalize ties between Turkey and Russia will benefit both sides’ economy as well as the region’s economy, particularly in the energy, tourism and trade sectors. Russian Economic Development Minister Alexey Ulyukayev said the trade and investment relations between Turkey and Russia would be rebuilt, according to a TASS report on July 1. An expert from the Energy Markets and Policies Institute (EPPEN) said the improving relations would make the most positive contributions in the energy sector. Russia has heavily invested in Turkey’s energy sector and a possible resolution over gas prices would be significant if both sides can agree. Nigyar Masumova, an academic from the World Economy Department of Moscow State International Relations University, said the normalization in ties was some good news during difficult days for the both countries. Trade and tourism ties will return to the former levels in a short time, while the planned Turkish Stream project could be delayed due to economic problems in Russia. “We believe that the sanctions imposed by Russia on fresh fruit and vegetable imports from Turkey will likely be abolished in the autumn,” she added. One is not very sure if Turkey shot down the Russian plane on the instructions from Pentagon and that could the reason why Russia did not retaliate because if it did retaliate NATO would attack Russian planes in the region leading to a brief war. . The Middle East total bankruptcy and the only country that Turkey can establish stable relations, start a dialogue and discuss political options with is Israel. Ankara and Tel Aviv’s increasing need to share field intelligence seems to have triggered this normalization. Recently, Mossad chief Yossi Cohen visited Ankara and met with the top brass of the intelligence-security bureaucracy led by Turkey’s intelligence chief Hakan Fidan. Turkey and Israel had enjoyed a privileged relationship for more than 60 years. Before the flotilla raid, there was truly far-reaching military cooperation between Israel and Turkey that dated back to the 1960s and peaked in the 1990s. With the 1994 Defense Cooperation Agreement and 1996 Military Training Cooperation Agreement, military-security relations between the two became the most intimate in the Middle East. This cooperation was particularly prominent in intelligence sharing, military training and the defense industry. But relations between the two countries went into a deep freeze in 2010, when Israeli commandos attacked a Turkish ship in the Gaza Freedom Flotilla. With the 1994 Defense Cooperation Agreement and 1996 Military Training Cooperation Agreement, military-security relations between the two became the most intimate in the Middle East. This cooperation was particularly prominent in intelligence sharing, military training and the defense industry. In the early 2000s, in return for Israel’s technical and intelligence support to Turkey in combating the Kurdistan Workers Party (PKK), Turkey shared with Israel the intelligence on Iran it had collected in Iraq and Turkey. Israel’s combat pilots participated in the annual Anatolian Eagle exercises held at an airfield in Turkey’s central Anatolian province of Konya, where they conducted training over mountainous topography unavailable in Israel. They also conducted regular joint exercises in the eastern Mediterranean until 2010. In return, Turkish pilots received training on surface-to-air missiles in Israel. In the defense industry, the most recent joint projects were the modernization of M60 tanks at a cost of $650 million and F-4E planes for about $1 billion, procurement and operation of armed Heron UAVs for $200 million, electronic reconnaissance and surveillance systems at $200 million, and procurement of missiles and smart ammunition for $150 million. Israel and Egypt have come to a deep understanding of the sources of instability and insecurity in Sinai, and the relationship between Hamas in Gaza and its primary sponsor, Iran, as well as ISIS. Turkey and Israel, mediated successfully by the USA and UK, have had excellent relations, including regular joint military exercise, for many years until the Mavi Marmara flotilla of 2010, symbolizing the beginning of a new chapter in the freedom struggle of Palestine. The Turkish-owned ship Mavi Marmara took part in a 2010 “Gaza flotilla” attempting to break Israel’s naval blockade of Gaza. After the 2010 Mavi Marmara flotilla Turkey made three demands of Israel: an Israeli apology for the deaths of Turkish activists; a financial settlement; and lifting the Gaza blockade, which Turkey claimed was illegal. In 2011, however, the UN Palmer Commission Report, produced as per the US-Israel demands, found the Zionist terror blockade of Gaza — jointly perpetrated with Egypt — to be legal, and said Israel owed Turkey neither an apology nor compensation. In 2013, at the urging of President Obama and to move the conversation off the impasse, PM Netanyahu did apologize for the loss of life and agree to discuss compensation. 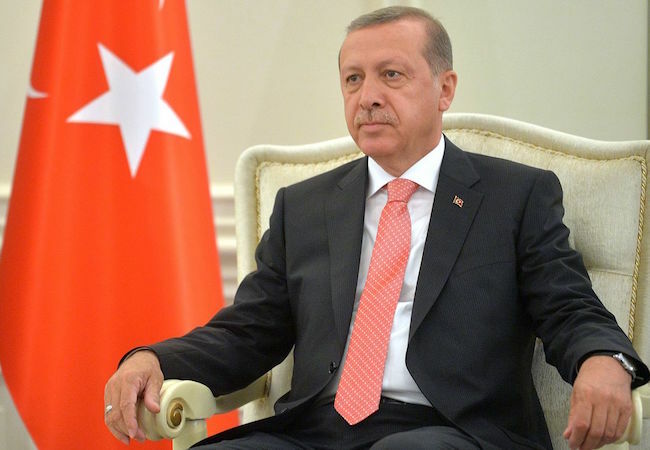 While Obama was pleased, Turkish President Erdogan repaid the gesture by denigrating Israel on Turkish television and announcing he would force the end of the blockade. Israel’s condition — that the office of Hamas in Ankara be closed — was ignored for the simple reason that Turkey Is not occupying Gaza Strip. . Nevertheless, in February 2014, Turkish Foreign Minister Ahmet Davutoglu told Turkish television that Israel and Turkey were “closer than ever” to normalizing relations.” And in February 2016, there was yet another announcement of imminent restoration of government-to-government ties. In March, Kurdish sources said Turkey was already demanding weapons from Israel, but that Israel wanted to ensure that Turkey would not use them against Kurdish forces. Alongside mending ties with Israel, Turkey began repairing relations with Turkey as well because restoring full relations between Israel and Turkey would irritate Russia, with which Israel has good trade and political relations, and understandings regarding Syria. Israel’s relations with the Kurds are also at issue. Most of illegal settlers in Palestine are of Russian origin and are a powerful group in the parliament and close links with Russia. And hence Israeli leaders like Netanyahu enjoy free lunch at Putin’s official palace In Moscow. .
Turkey’s assertive diplomacy got revealed when in 2010 Turkey sent the Mavi Marmara aidship with humanitarian assistance to breach the Israeli blockades around Gaza Strip. Nine Turkish activists and one American from IHH Humanitarian Relief Foundation were killed during an Israeli commando terror raid on the Mavi Marmara cruise ship and blocked humanitarian help for the Gaza Strip. Turkey broke off the bilateral ties forthwith. On Nov. 24, 2015, Turkish F-16s shot down a Syrian-based Russian bomber that had allegedly strayed into its airspace. This triggered a confrontation between Ankara and Moscow, and especially between the two presidents, Recep Tayyip Erdogan and Vladimir Putin. The Russian ambassador was recalled, harsh and damaging economic sanctions were applied, and there were even threats of war. The war of words and military muscle flexing in Syria, the Caucasus, the Black Sea and the Mediterranean continued all through the first half of 2016. Turkey requested a stronger NATO presence in the Black Sea to help protect it against a more assertive Russia. History has shown that only the USA can effectively pursue assertive diplomacy and so far even Russian has not be able to achieve it without US help as it is happening in Syria. Without being a superpower, Turkey faced serious opposition to its assertive diplomacy because its punitive measures against Israel and Russia threatened to cause damages to Turkey in the short term at least. USA which shields the Zionist crimes against humanity has made overtones to collaborate with Russia in Syria and Mideast East. So, Istanbul sensed danger because Russia and Israel jointly begin a containment approach towards Turkey. After the Mavi Marmara incident, intelligence sharing between the two countries came to an end, followed by cancelations in military training and cooperation.. After the downgrading of ties with Turkey, Israel conducted a series of military exercises with the air, sea and ground forces of Greece and the Greek Cypriots with which Turkey has problems. After pursuing an assertive diplomacy for a few years, Turkey has now reverted to back to a big power policy format that, as before, would not only get back to US-Israeli orbit but also realign its relations with Russia with which it developed a serious conflictual situation. The reason for the former Ottoman Empire to revise its policy in favor of Israel seems to be that it knew the e level of influence over USA and many other countries that also began a negative approach to Turkey after the Israeli –Turkish clash over breaching of Israeli terror blockade to Gaza Strip. Turkey helps all big powers in selling their terror goods to third world, including India. . Though isolated internationally no-account of its illegal colonies and genocides in Palestine, Israel still calls all shots in Mideast with its arms and triclomatic arsenals. Selling terror goods to third world and receiving aid from USA and EU, Israel has generally good economic and political relations with Russia and Turkey while Russia and Turkey are doing a slow burn. Islamic world’s bilateral trade with Turkey is not impressive. Most Muslim nations have been purchasing terror goods from USA, Europe, Israel and Russia while Turkey has not made any serious effort to build up its economic relations with Islamic world. Antagonism with Israel only harmed turkey as Islamic world has not come for economic ties with Istanbul in order to assure it their support. True, for too long Turkey rejected Israeli moves to restart the diplomatic and military relations. But since 2014, therefore, Turkey has been searching to renew ties with Israel. Saudi Arabia’s tensions with Iran and the USA after the West-Iran nuclear deal in 2015 have encouraged Saudi rapprochement with Israel. Turkey followed the suit accepting the new reality and realignment with Israel was found to be “profitable” option. In fact, this is part of a new regional reality, where those countries, along with Qatar and Jordan, fear spillover from Syria and Iraq. Turkey learns that it cannot pursue any assertive foreign policy in order to advance its legitimate interests globally without the help of USA and with Israel opposing it as a counter force, especially when USA and Israel operate jointly. Turley has begun to take sharp turns in its foreign policy. Following a statement by Prime Minister Binali Yildirim that Turkey will pursue a more realistic foreign policy to decrease enemies and increase friends, the first major turn has appeared in Israel-Turkey relations after May 31, 2010, when the Israeli military raided a Turkish flotilla that was trying to break through the Israeli blockade and deliver humanitarian relief supplies to Gaza. 10 Turkish nationals and an American aid worker were among those killed by Israeli military attack. While Turkey strained its ties with arrogant and fascist Israel, USA did not consider the killing of its citizen by Israeli military as a crime at all because he was not killed by Islamic terrorists. Over the past two weeks, three remarkable things happened. On June 26, Israel and Turkey agreed to restore normal diplomatic relations, potentially unlocking the development of huge offshore natural gas fields in the Eastern Mediterranean. The next day, Kremlin spokesman Dmitry Peskov announced that Erdogan had apologized for the downing of the Russian warplane in a letter to Putin. Russia lifted its ban on package tours to Turkey the same week, and relations began to normalize. Today, Israel is the country closest to the US and Russia. That is why Israel can play a middle role in preserving Ankara’s relations with the US at an appropriate level and also help normalize relations with Russia. However, it is unlikely that Turkey-Israel relations will be restored to 1990s levels anytime soon but this may help the shaping of a new geopolitical equation for the eastern Mediterranean and facilitate their counterbalancing of Iran in the region. Naturally, the PKK, Hamas, Iran, the Syrian regime, ISIS and Russia won’t be happy about rewinding of bilateral ties. Israel wants Turkey to help play a more active role in NATO. In ore rot take Russia on board to reduce tensions, Turkey has made up with Russia as well. Notwithstanding the benefit both parties, rapprochement between Israel and Turkey is likely to be much more expensive for Turkey. Zionist criminal mindset: Politics of convenience? The normalization agreement was supposed to include long-term Turkish demands at compensation for the deaths in 2010, as well as a decision about Gaza. B. Netanyahu had consented to another Turkish demand in 2013 by issuing an apology of sorts in a phone conversation with Erdoğan. US President B. Obama was reported to have a close role in encouraging the conversation to take place. The rise of the AKP in Turkey’s 2002 elections changed the diplomatic playing field. New faces in Ankara were less interested in Israel and more interested in a new regional paradigm that would see rising Turkish influence. Turkey sought to mediate between Israel and Syria over the Golan Heights in 2009. Erdoğan was shocked by fascist PM Ehud Olmert, who mercilessly killed even children to win the general poll, visiting him in 2009 and then going to war in Gaza, rather than concluding a deal with Syria. Israel’s military minister Ehud Barak said Israel did “teach the Turks a lesson”. Erdoğan was “personally offended” and felt humiliated by Israel as USA watched the terror show on sea by Zionist military using US terror goods. . It was in this context that Erdoğan sat with Peres at Davos and accused him of killing Gazans. The resulting deaths irrevocably harmed relations. In March of 2016, Israeli Energy Minister Yuval Steinitz met Erdoğan in Washington and discussed the war in Syria, Iran’s presence there, terrorism—and natural gas. Reuters claimed that the issue of Israeli exports of natural gas to Turkey was an essential piece of the puzzle because Turkey has been weaned of Russian gas since their relations strained over Syria. The implications of this policy shift are enormous. It will integrate the refugees into Turkey’s economy, which is likely to accelerate growth – especially since many of the Syrians are highly qualified professionals. It also strengthens Mr. Erdogan’s political base, giving him a new cohort of likely supporters. The realignment process will have implications for the Syrian conflict, natural gas exports and Saudi-Israeli relations. Israel has always sought to maintain good relations with the Turks, and the two countries had enjoyed relatively warm relations since the 1950s. Turkey was the first Muslim country to recognize Israel. As a powerful non-Arab state in the region and NATO member, Turkey was aligned with Israel during the Cold War. Several founders of the state of Israel were educated in Istanbul, and there was an affinity between the two country’s national movements. The larger picture is the regional chaos that has unfolded since the break in relations in 2010. The Arab Spring in 2011 brought Morsi to power in Egypt. And when rebellion broke out in Syria, Turkey hoped that the Syrian rebels, whose more Sunni Islamic ideology tended to meld well with Turkey’s own AKP, would push Bashar al-Assad from power. But the rebels faltered, Islamic State took over part of Syria, and the United States and UK decided not to bomb Assad in 2013. Turkey continues to support Syria’s rebels, but it knows Assad will not fall. Morsi was pushed from power in 2013 in what Turkey considers a coup. In sum, these moves transform Turkey’s position. Europe will have to reconsider its hypocritically superior attitude toward a country that is an indispensible regional partner, and which has also done much more for Syrian refugees than the EU itself. What is most encouraging about these developments is their common denominator: pragmatism. This may bode well for resolving Turkey’s worst predicament, the Kurdish conflict, which has degenerated into a near-civil war raging in the country’s southeast. Pragmatic leadership in Ankara, dealing from a position of strength, may find ways to accommodate Kurdish interests within the Turkish republic. This solution could even prove attractive for the Kurdish state in northern Iraq, which might become Turkey’s close associate. Turkey opposes the Kurdish movement for a soverign state. Maybe, Turkey thought Russia and Israel could openly support the Kurdish movement for a separate state. Perhaps the most important development of the past two weeks is President Erdogan’s offer to grant Turkish citizenship to Syrian refugees in Turkey. Turkey is now back as a leading regional power in the Eastern Mediterranean. USA knows Israel’s security is tied with that of Palestine and Israel cannot ensure security of its lands and people if they don’t allow security and freedom to Palestinians. Turkey insists Israel breaks all terror blockades around Gaza strip and let the Palestinians have some freedoms. To meet Turkey’s condition, Israel would have to abandon the terror based security arrangement it shares with Egypt against Palestine, which has increased Israel’s own imagined security and pay regional dividends. Israelis are cleaver people who know its security is linked with the security of Palestinians and with intermittent terror attacks on Gaza, Israel cannot ensure its security. Even when Israeli military keeps attacking Palestinians in Gaza Strip, killing even women and children, in 2011, the UN Palmer Commission Report found the blockade of Gaza — jointly administered with Egypt — to be legal, and said Israel owed Turkey neither an apology nor compensation. It argued that lifting the Israel/Egypt embargo on Gaza would empower Gaza rulers Hamas, and thereby the Muslim Brotherhood, Iran and ISIS — which would seem an enormous risk for no gain. Quartet should have worried about mutual security for both Palestine and Israel as a two state solution is looming large to enable both Palestine and Israel exist side by side. However, like Israel and USA, the Quartet is also interested in Zionist expansionism and one state idea of Jews. Turkey’s decision to renew ties with both Russia and Israel is timely as it did not want to precipitate the conflict further and that move welcomed even by intentional community wanting peace. The EU issue of Turkey remains intact, though the recent Brexit move gives hopes for its speedy entry. The Kurdish problem, being accelerated by the war in Syria and ISIS attacks is not easy to solve but by realigning with both Russia and Israel, the problem cannot wire explosive. With a shift assertive diplomacy in favor of peaceful one, Ankara can now try to shoulder leadership of the Islamic world along with Saudi Arabia. Netanyahu has publicly supported the establishment of a Kurdish state. Even at the peak of Israeli-Turkish relations, Israel’s support of the Kurds has been a relatively open political secret. Although the Israeli government consistently denies providing weapons, reputable sources suggest, at a minimum, training for Kurdish forces. Most recently, Israel acknowledged buying oil from Kurdish sources in Northern Iraq, and IsraAid, an Israeli humanitarian organization, provided assistance to Kurdish refugees fleeing ISIS. Turkey’s problems with Israel, Russia and Egypt are based purely on principles because they wronged with Turkey by taking undue advantage of the US led NATO war on Islam (terror war). Turkey’s prompt action as a soverign Muslim nation having regard for Islam led to deterioration of relations with all these three powers. The Arab Spring and NATO terror wars on Islam for energy resources, the US attacks on Libya and Syria, followed by Russian military intervention on behalf of an adamant Assad, among other factors, made Israeli fascist occupation and crimes against humanity fairly easier as it also claims legitimacy for its crimes and occupational settlements. For Israel to trade its increasingly important relations with Russia, with Egypt — and thereby with Saudi Arabia — and with the Kurds for Turkish political approval and a promise to buy Israeli natural gas would seem to be a good idea for future deals. The new developments taking pace with Turkey playing active reconciliation role are likely to give benefit to Mideast and Israel by negating and ending the Israel-Egypt terror blockades of Gaza. In order to conduct smooth foreign policy globally, especially in Europe and West Asia, Israel needs to lift the Israel/Egypt embargo on Gaza by removing all terror blockades without unnecessarily wasting brains if the action would empower Hamas or the Muslim Brotherhood or Iran or ISIS because maintaining the blockades would never let Israel gain credible security, though Palestinians would continue to suffer and continue to fight for survival and sovereignty. By giving defacto status the UN has already declared Palestine state a reality. Time is over for Israel, UN, ICJ and Quartet to consider seriously about a soverign Palestine state and peace in West Asia. If the ICJ and ICC think no peace is possible in Mideast unless Israeli criminals are punished, then they should first punish them. US leaders who have promoted the criminal Zionist regime in Mideast must also deserve punishments for their deliberate crimes, including misuse of the veto to shield the Zionist crimes against humanity. With Turkey’s shift in foreign policy structuring, will Russia and Israel become true allies of Turkey? This trillion dollar question deserves a definite answer if one is forthcoming.